With Riffstation, you can set the pace! Slow down any song without affecting the pitch and sync a metronome to help with your timing. Our amazing slow down tool lets you slow down or speed up any song in your music collection without affecting the pitch. You can slow down as much as much as 25% of the original tempo, or speed up to double speed and everywhere in between. Our high quality time stretching algorithm ensures that the pitch and quality of the sound remain as natural as possible. Now you can learn and practice at your own speed. Have you ever tried to learn or practice a song only to find it’s tuned a half step down or between two keys? Perhaps you like to sing too and you’d prefer to learn the song in a different key than the original recording. With the pitch tool you can transpose any song to a new key without affecting tempo. For the out of tune recordings, you can fine tune in cents! Now you can retune the song instead of the guitar. Riffstation also has a capo tool which allows you to transpose only the chords without transposing the audio. This is a fun and useful program! Aimed at guitar players who want to know the chords to a song so they can play along. Pitch and tempo changes would be helpful for any instrument or vocals. Note: this is same version I got from SOS in May: 1.6.3.0. Tempo shift is very usable even at half speed, letting you hear details of instruments and rhythms and learning notes and chords at a more manageable pace. When you can play along flawlessly at 110% speed then you’re ready to go out and perform! The pitch shift lets you match the tuning of a song to your guitar or vocal range — you can adjust by semitones (frets) and fine tune as needed. Sounds good across a wide range. You can drop the pitch a whole octave to turn a guitar part into a bass part. The adjusted (processed) audio can be saved as a .WAV file (no MP3 or OGG or FLAC) so you can share it with someone else in your band who wants to learn at a slower pace in the singer’s vocal range. Or, save the file to your phone or MP3 player so you can practice on the porch or in a hotel room. The Chord Viewer section shows a fretboard diagram of how to play each chord, and even shows what chord is coming up next so you can be ready for it. A chord finder lets you look up a chord you want to learn. A built-in metronome can help emphasize the beat. And you can focus on a section of a song you need to work on, by setting a loop. Easy stuff. Using a capo? The capo option in the program lets you set the fret for the capo, then all chords are adjusted. So for a capo on 5th fret, it shows an E chord as “B”. You would play a B chord to get a sound like an E chord. This makes it simple! One of the stranger features, and what could be the most fun, is the Riff Builder. It took me about 10 minutes to figure it out, using the on line help file. It lets you grab beats of a song and save them as a riff. You can grab several beats in a row for a chord, or single beats for parts of a solo, and you can combine up to 16 beats into a single riff, up to 6 riffs. Then the Song Builder section lets you combine your riffs in any order, up to 16. Say you have a song with this chord pattern: G Bb C D G Bb C D…. You could save out a C as riff 1, a G as riff 2, and (this is very cool) save a G as riff 3 but drop its pitch down two notes to F. Now you can make a new song in Song Builder by adding your riffs as 1, 3, 1, 1, 3, 3, 1, 1, 2, 3, 1, 2 to get a 12-bar blues (C, F, C, C, F, F, C, C, G, F, C, G). The possibilities of grabbing sections of a solo and rebuilding it are limitless. The program also lets you isolate what you want to hear in the song, letting you pick the frequency range and filtering out high/low notes, and switching between mono and stereo. I completely knocked out the vocals on a song and the guitar was still very clear. On another I wanted to isolate the organ part but couldn’t really lower the guitar & bass parts. So it depends on how the song was recorded, but can be very good. 1. It only recognizes major and minor chords, in order to improve accuracy. I know people who perform in public that don’t know any other chord types, but a lot of music needs 7th, 9th, suspended, and chord sequences with descending or ascending notes. So this gives an excellent starting point for beginners, not so much for experienced players. 2. Chord Finder is limited to major, minor, 7th, major 7, minor 7th, sus2 and sus4. Big improvement over only major and minor, but no way to hear the chords and there are a LOT more chord types out there. 3. On longer songs (like 29 minutes of “Ashes are Burning” from Renaissance) it takes a 30 seconds or more to detect chords, and you’re limited to how far you can zoom in the waveform. Hard to see the individual chords! But the solution is to cut large songs into sections with Audacity or a similar program. 4. Can’t enlarge the window. Not terrible for me at 1920 X 1200, it fills just over 1/4 of the screen, but people with high-res monitors will only see a very small window. 5. No concept of time signature, it’s all just beats. So 3/4, 4/4, 5/8, etc. don’t have any effect. Metronome clicks the same for every beat. I haven’t tried it on a song with a swing rhythm (beats alternate between long and short) but assume it would pick some average value. It would be close enough for learning. 6. Program crashed once as I was adding riffs to the song builder. 7. Riffs are named as A,B,C,D,E,F. This gets confusing since those look like chord or note names. I think numbers would be clearer. Overall I like this program a lot and can see using it when I want to learn a new song. I can take the major/minor chords listed and figure out if they should 6th or 7th or 9th, etc. The speed and pitch change is one of the best I’ve heard and easy to use. Being able to save the songs out means I can practice without my PC. User interface is nice to look at and not cluttered, although it does take some effort to understand the Riff Builder aspect. Highly recommended even for experienced players, and a Must Have for beginners! I tested the software after the trouble-free instalation on a guitar-vocal mp3 for which I had already beforehand determined the chords. The results were accurate up to a very satisfactory level, that is all chords were determined correctly except for a shift from D to Dm that was interpreted as Dm throughout. I think that such cases can one fine tune by ear after getting quite acurate overall interpretation and I prefer this, to having too many chords recognised. The finger positions on the instrument were also reliably good, for some reason the F#m was displayed on 4 strings with the 5th and 6th string dumped, but again a musician will hardly need this, and an amateur will have a reliable guidance. The program is targeted to guitar players I suppose and not keyboard players. The song is interpreted on the fly, that is as it is played with chord transitions displayed accurately as the song is played. The user interface is very attractive and not complicated. The option to isolate instruments successfully isolated vocals from guitar – the test song that I used did not have other instruments to see how it would behave eg. when base guitar and keyboards were also there. The pitch shifter and tempo were working as expected. It was useful that the tempo of the original song was displayed as bpm. Overall I can say that I am impressed. What would be good would be an option to export the sequence of chords in a text file so that one could print it out and add the lyrics and have something to play the song afterwards. As it is, one must take a sheet of paper and write everything out oneself, but even so the program is immensly useful and effective. Congratulations to the developers and thanks for the nice giveaway! Music editing and production are two things that are not as easy as they seem. In today’s world more and more digital music is being produced, and many softwares are now involved in the production and editing of the music. Some of these software are designed and are suitable for only professionals, while a few developers focus on developing software for users at home. Riffstation Pro is a great tool for both experienced and amateur guitarists. It allows you to view the chords from any songs you want and perform different modifications to the track to extract the sounds you need. The installer size is ~29MB, and the installation process is simple and straightforward, taking no time at all to complete. Once done, you can straightaway launch the application, as the version provided here comes pre-activated and registered for use. You can load up a track, and start using this application, and take advantage of the tools that it comes packed with. The UI is well designed, and presents all the tools and features in an arrangement that looks similar to hardware audio controllers and components. That is why, it is easy to use and simple to understand, as for the most part you are dealing with different knobs and buttons. At the top is the menu bar with usual drop down menus, followed by an area that shows waveform of the loaded track. Under the waveform, you can see the detected chords, and the sizes depend on the duration the chord is played in the track. The section under is divided into three parts, namely Jam Master, Riff Builder, and Chord Viewer. The section under contains buttons to Play/Pause, Stop, Forward, Reverse, and knobs metronome and volume. – The UI has a great intuitive design, that should be easy to use for all types of users, even the novices. – Automatic chord recognition technology, analyzes and figures out the chords for you. – Slow down or speed up songs without affecting the pitch of the song. – Change the tempo and beats per minute rate. – Change the pitch, adjust semi tones, and fine tune keys and chords. – You can isolate different sounds and instruments in a track. Using the graphical display, you can scan and find instrument you want. Then use the width and separation controls to fine tune the sound. – Metronome tool to that helps you with beats when you are slowing down the track. – It should come with at least a few basic editing and recording tools. 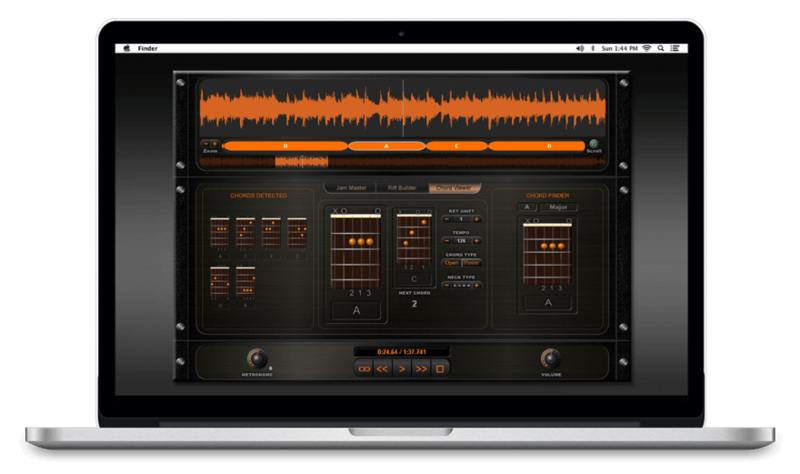 Riffstation Pro is a great tool for musicians and guitarists of all experience levels. The application runs smoothly, without any lag or errors. It comes with useful tools, so it is worth trying.